Ukrainian Canadian Congress > UCC Communiques & News > International community must act: Free Ukrainian POWs! 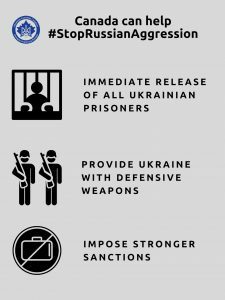 International community must act: Free Ukrainian POWs! January 17, 2019. OTTAWA. On January 15, a Russian “court” illegally prolonged the detention of 24 Ukrainian sailors captured during a Russian naval attack on Ukrainian ships in the Black Sea on November 25, 2018. The Ukrainian Canadian Congress (UCC) calls on Canada and the international community to increase pressure on Russia to immediately release the Ukrainian sailors. The Ukrainian sailors held captive by Russia are Prisoners of War and protected by the Geneva Convention. Implement specific sanctions against Russia in response to the November 25 Kerch Strait attack. Actions should include: a) Sanctions on Russian state financial institutions; b) Sanctions on Russian shipping including banning Canadian ships from docking in Russian ports in the Sea of Azov and Black Sea and banning Russian ships from Canadian ports.